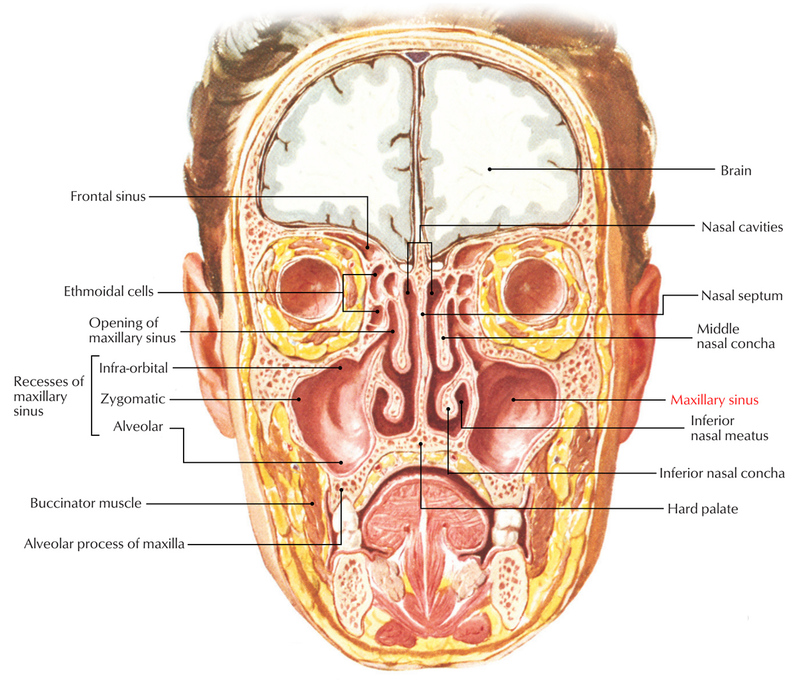 The maxillary sinuses are the largest of the paranasal sinuses, located one on each side as well as totally fill the bodies of the maxillae. Each is pyramid shaped with the laterally pointed top and the base deep towards the lateral wall of the neighboring nasal cavity. The maxilla along with the portions of the inferior concha as well as palatine bone that is located on the top of the maxillary hiatus creates the medial wall or base of the maxillary sinus. 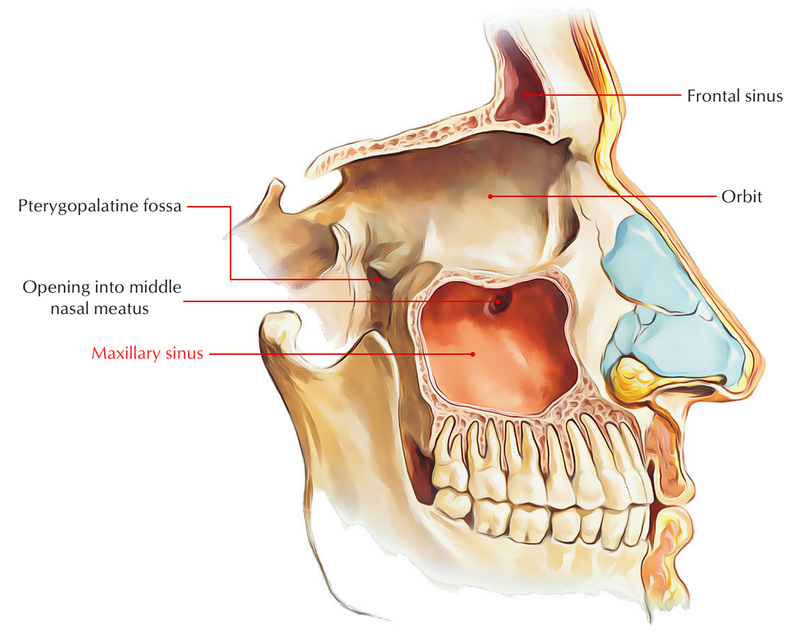 The opening of the maxillary sinus is located in the center of the semilunar hiatus which grooves the lateral wall of the middle nasal meatus, near the top part of the base. The maxillary sinus develops first. It rises around the 4th month of fetal life as an out-pouching via the mucous membrane covering the lateral wall of the nasal cavity. It is undeveloped at birth, expands swiftly in the course of 6-7 years and gets fully developed after the eruption of permanent teeth at puberty. It is pyramid shaped with the base pointed medially towards the lateral wall of the nose as well as its apex towards the zygomatic bone laterally. Roof is formed by the floor of the orbit. The infraorbital nerve as well as artery traverses the roof in a bony canal. Uncinate process of ethmoid, superiorly. Descending process of lacrimal, anteriorly. Ethmoidal process of inferior nasal concha, inferiorly. Perpendicular plate of palatine, posteriorly. Maxillary sinuses open nearby the roof of the sinus in the semilunar hiatus of middle meatus. It is from maxillary and infraorbital arteries by the anterior, middle, and posterior superior alveolar arteries. Submandibular lymph nodes drain the sinus. The anterior, middle, and posterior superior alveolar nerves from the maxillary and infraorbital nerves supply the maxillary sinuses. This sinus can acquire infection from infected nose (viral rhinitis), carious upper premolar as well as molar teeth, especially molars, along with infected frontal and anterior ethmoidal sinuses. It functions like a tributary container for pus from frontal air sinus via frontonasal duct along with hiatus semilunaris. Due to common innervation by the maxillary nerve, pain of maxillary sinusitis is transmitted towards the upper teeth and infraorbital skin. Displacement of the eyeball and creates proptosis i.e. protrusion of eyeball and diplopia or double vision appears due to the upward infiltration into the orbit. Connection of infraorbital nerve creates pain along with anesthesia in the skin above the face below the orbit. Noticeable protuberance or even ulceration of palatal roof of the oral cavity is created by the downward infiltration into the floor. The medial invasion intrudes the nasal cavity causing obstruction as well as epistaxis. Epiphora or overflow of tears is produced by the obstruction of nasolacrimal duct in this wall. Inflammation on the face and palpable mass in the gingivolabial fold is created by the lateral infiltration. Posterior invasion may include the palatine nerves causing acute transmitted pain towards the upper teeth.